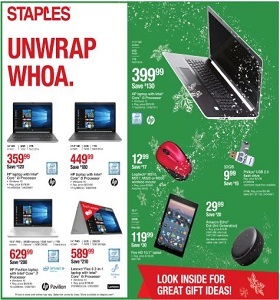 Staples Weekly Ad December 9 - December 15, 2018. Unwrap Whoa! Staples Weekly Ad December 9 – December 15, 2018. Unwrap Whoa! -$199.99 Staples Ayalon Mesh and Fabric Task Chair; $89.99 Seagate 4 TB USB 3.0 Desktop Backup Plus Hub Hard Drive.